Okay, I'm so jealous of those of you living in the west coast! I would love to see Disney's Peter Pan at the El Capitan Theatre in Hollywood before it's Diamond Edition Blu-Ray Combo pack release on February 5th. Between January 11 to February 13, 2013, join in the exclusive screening of Peter Pan. They even have special events planned out. Before the movie, in celebration of its 60th anniversary release, there'll be a never before seen episode of Disney Junior's “Jake and the Never Land Pirates” prior to the movie screening. As an additional bonus, movie goers will also enjoy a on-stage live appearance of Jake. Now, read carefully...there are also special events planned throughout. Doors open at 6:30 PM PST and the discussion moderated by Leonard Maltin will start at 7PM. Panelists include Kathryn Beaumont (voice of Wendy), Margaret Kerry (live-action reference model for Tinker Bell) and Ted Thomas (son of legendary Disney animator Frank Thomas). Ted Thomas also produced an all-new featurette on the Children of the Nine Old Men, a bonus feature found on the Peter Pan Diamond Edition Blu-ray release. The movie will start afterwards. On Saturday, January 19th, El Capitan Theatre and Disney Junior will be celebrating Jake FROM "JAKE AND THE NEVER LAND PIRATES" Birthday. Enjoy the birthday party with Jake and enjoy a live performance by SHARKY and BONES of The Never Land Pirate Band. Did we mention that there'll also be giveaways? Don't miss out! El Capitan guests are invited to a character breakfast with Jake from "Jake and the Never Land Pirates" at Disney’s Soda Fountain & Studio Store before the 10AM showing every Saturday and Sunday. Be sure to reserve your spot as seating is limited. 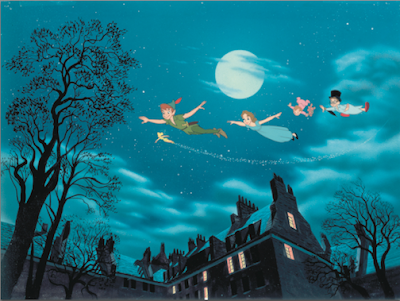 On Tuesdays, “Peter Pan” screenings will featuring dimmed lights and reduced sound levels to accommodate small children's sensitive ears. Daily showtimes for “Peter Pan” are 10AM, 1PM, 4PM and 7PM. Buy tickets now at the El Capitan Theatre (6838 Hollywood Blvd. ), online, or by calling 1-800-DISNEY6. Enjoy group rates for parties of 20 or more by calling 1-818-845-3110. It's time to journey to Never Land! My kids love this show! Looks super cute. I wish I lived in LA so I could go to the El Capitan Theatre for this! Love this movie! How Fun! i wish I could go to this event! Sounds like a lot of fun! Oh how I wish we had the time to make it up to LA for these events. Movies at the El Capitan just make the whole experience better.